The AIC Hotel Group has teamed up with KIDZ BOP, a music brand for kids, to create KIDZ BOP Experience at Hard Rock Hotel Riviera Maya, which will make its debut at the resort this coming summer. 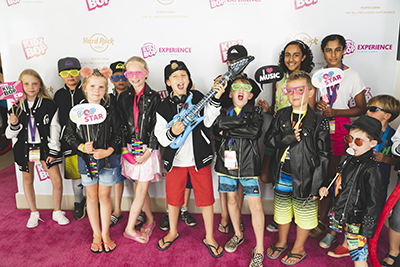 Already a part of programming at Hard Rock Hotel & Casino Punta Cana, the new KIDZ BOP Experience at Riviera Maya will allow kids six to 12 years of age the chance to live out their pop star dreams with KIDZ BOP themed activities. To celebrate the latest launch, The KIDZ BOP Kids will make a special visit to the resort 12-16AUG for the “ Ultimate KIDZ BOP Live Fan Experience,” which will feature a variety of events, activities, meet-and-greets and a live performance. The KIDZ BOP Kids will also perform a live concert for all guests on 14AUG, in addition to attending exclusive superfan events throughout the week. In the Pop Star Lounge, kids will have the chance to dress up, create a custom band name with Instaband, learn new dance moves with Step It Up, write their own songs with Hit Maker and design their next album cover at the Creation Station. They will also have the opportunity to star in their favorite KIDZ BOP music videos and sing their favourite songs with KIDZ BOP Karaoke. The KIDZ BOP Experience will also expand into the hotel’s weekly programming with a series of ice cream socials, fun pool parties and pop-up events. For additional information on the KIDZ BOP Experience , visit www.KIDZBOPExperience.com.